Zechariah is not done telling us about the greatest sellout of all time. Now he is going to tell us that the betrayal would be done for free. Kind of ironic isn’t it? How can you sell something for free? If it’s free, then doesn’t that make it a gift? In order for Jesus to fulfill His destiny, which was to be the ultimate gift to mankind, He had to be sold out. So in a strange way, I guess it was this treasonous gift that was instrumental for the greatest gift of all. Our Lord and Savior’s life given willingly and freely for the forgiveness of our sins. Can it get any more bizarre than this? A friend and disciple is going to sell out the King of Salvation and then makes the decision that it was a poor bargain. God is predicting that Judas won’t be able to live with himself and that he will throw the payment back into the temple, the house of the Lord, to the potter. For this to happen, Judas will have to realize that he has been used by the devil and will want to try to wash his hands of the transaction. In the end, Zechariah tells us that Judas will pay the ultimate cost. He will hang his head in consuming shame, just prior to his final despair, where as a madman, he will hang his head from a tree. 5. Zechariah 11:13 And the LORD said to me, “Throw it to the potter”– “that princely price they set on me.” So I took the thirty pieces of silver and threw them into the house of the LORD for the potter. Remember, I promised to use the Old Testament to prove that the 30 pieces of silver would be used for pricing the life of our Lord and Savior? Well there it is. In the last chapter, I proved this claim by using references from the New Testament. However now we can reference it back to the Old Testament as it clearly states in Zechariah 11:13, the Lord told this individual to throw back the thirty pieces of silver that was used to price Him. Now that completes the circle regarding the 30 pieces of silver. We know from the Old Testament that a person is going to negotiate the specific price of turning in our Lord, he would be paid the 30 pieces of silver to complete the sellout of our Lord, and then that person would throw the 30 pieces of silver back into the house of the Lord. The only thing that we could not learn from the Old Testament was the name of the betrayer. That of course, clearly laid out in the New Testament, is Judas Iscariot, as I have shown in Chapter 8. Is it any wonder that Judas threw the 30 pieces of silver back into the house of the Lord? If I was confronted by the Lord my God, and told that I must throw the blood money back into the temple, I think I would do as I was told. It then becomes very obvious why Judas would submit to the demons and hang himself. In reality he had already done it mentally, and given the magnitude of his actions, it was just a small step to do it physically. As terrible as this tragedy is for Judas, we must move onward to the next point. Somehow Judas’ payoff is going to benefit the potter. Now what should be made of this reference to the potter? Zechariah is telling us that the 30 pieces of silver will be thrown into the house of the Lord and will be used by the potter. Would you like to venture a guess as to what the 30 pieces of silver ended up being used for? Do you think that perhaps the priests just pocketed the money? Matthew 27:6-8 But the chief priests took the silver pieces and said, "It is not lawful to put them into the treasury, because they are the price of blood.” And they consulted together and bought with them the potter’s field, to bury strangers in. 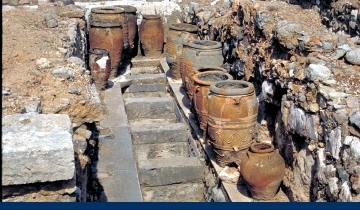 The money was used to buy the potter’s field. So in reality, just like Zechariah had predicted 500 years earlier, Judas had thrown the money to the potter. 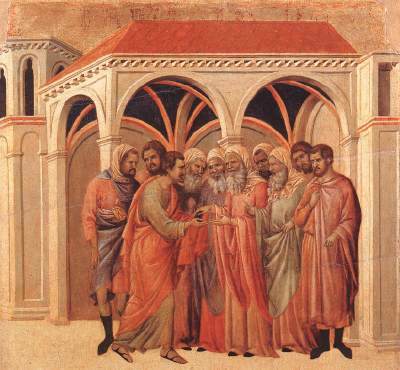 By throwing the money into the temple and forcing the priests to wash their hands of this blood money, Judas’s silver sellout payment was ultimately used to purchase the potter’s field. This turned out just as Zechariah had predicted it would. Finally one last point regarding this prophecy. Zechariah says that he took the 30 pieces of silver and threw it into the house of the Lord. Notice that he did not mail the money back, or hand it back in a nice fashion. Our Lord is telling us that the money is going to be thrown back into the house of the temple. Now this is important for two reasons. First, we know where Judas must return the money. Scripture is very specific in stating the house of the Lord. Therefore, we must assume that if he returns the money to the temple, then the temple must still be standing. Now that might seem inconsequential, however it turns out that it would have been impossible to fulfill that prophecy if it would have happened just 40 years later. In fact, it would have been impossible for every year from 70 AD for the next 1,938 years. Why do I say that? Because in 66 AD the Romans sent Titus to pulverize the Jewish uprising. 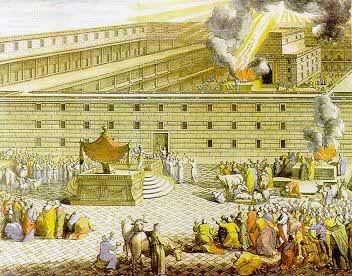 It took four years, but in 70 AD Jerusalem fell and the temple was burned down. Nearly a million Jews were killed. So in less than 40 years after our Savior was crucified, the Lord’s house would become obliterated. Was Jesus aware of this coming temple destruction? Yes! During His last few days on earth, He even predicted the destruction of the temple. Sure enough when the temple caught fire, all the gold inlays and sculptures melted and flowed in between the rocks. Therefore Roman soldiers and masses of people took apart every single rock looking for the melted gold. Not one stone was left on top of another. This meant that the time was very limited for this prophecy to come to pass. If it would have occurred 41 years after it did, then the prophecy would have gone against the word of God, because the temple was needed for the return of the money. As I have made perfectly clear by now, or at least I hope so, God is not content with laying out a fuzzy prophecy that would be easy to fulfill. He goes miles beyond the extra step to create a degree of complication that makes it nearly impossible to come to pass. Isn’t it good enough to predict that someone would sell you out 500 years from now? How about specifying the currency and the selling price? That is as solid as I could possibly imagine, but that would still not be good enough. Our Lord does not want to leave any wiggle room whatsoever for any degree of doubt. He tells us that the betrayer is going to reconsider his actions after being confronted with the truth and will return the 30 pieces of silver. In fact we know specifically how and where he is to return the money. He is to throw it into the house of the Lord. He even goes so far as to tell us what that money will ultimately be used for. The money must somehow benefit the potter. We even know the timing. It must all occur while the temple is still standing. Why is this level of detail so critical you may ask? I’ll tell you the truth my friend, there are a whole bunch of folks out there that want to deceive you. They are serving a master that is clever and extremely deceptive. They want to convince you that the Bible is just a bunch of stories and that you must not take it too seriously. They are intent on pushing you off the path of salvation and onto a road to nowhere. They try to tell you that everything is relative and that God loves you just as you are. (Are you kidding me? Then go tell Jesus that he gave his life for no reason whatsoever.) The only thing worse then listening to a fool, is following a fool. Follow the Word of God and you’ll never have to worry. What were the odds of this happening by chance or coincidence? Chuck Missler i.e. (p. 226) put this at one in 100,000. I would have to say that is very conservative. I could not imagine the likelihood of a traitor returning 30 pieces of silver by specifically throwing it into the temple. Then I would have to guess that it cannot stay in the treasury. But it wasn’t going to be wasted, so I would also need to guess that it would be used to purchase something, but what could it be? Perhaps food for the poor, or maybe a fund for the widows, or even a home for the orphans? Why of course. Let’s purchase a potters field. It’s obvious; I could see it coming a mile away. Yeah, right.